Giving birth is one of the most intense and painful experiences a woman will ever experience during her life. Pushing a 6 or 8 pound baby out of the body through an extremely small birth canal often tests the physical limitations of the female body. A typical labor and delivery can involve hours of pain from powerful uterine contractions, stretching, tearing and pressure. This is why maternal pain management has become an important component of modern obstetric practice. In recent years the epidural has become the predominant method of pain management for women in labor. According to recent studies, an epidural is given for pain in over 60% of all hospital deliveries. Like all medications and procedures, however, the epidural has cons as well as pros. 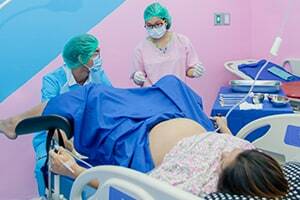 This page will give a brief overview of the good and bad things about epidurals during childbirth. What Exactly is an Epidural? The term epidural refers to the process of administering regional anesthesia medication directly into the epidural space in the mother's lower spine. The epidural space is an area which surrounds the spine and is filled with fluid. The nerve pathways which carry pain and other sensation from the brain to the lower body run through the spine area. When a regional analgesic medication is injected directly into the epidural space it basically blocks pain signals from going to the lower body through these nerve pathways. This makes the epidural a highly effective method of numbing the lower half of a mother's body during labor. This significantly decreases the level of pain that the mother feels during labor and delivery. The exact type of drug or combination of drugs administered with an epidural varies. Regular Epidural: a larger drip needle is inserted directly into the epidural space in the lower spinal area and fixed in place. The needle is then hooked up to a small catheter in that same area and connected to a drip or pump. Combined Spinal Epidural (CSE): a CSE is a special type of epidural that delivers faster pain relief than a regular epidural. With a CSE a local anesthetic is first given in the lower spine, then a needle tap is done and attached to the drip or pump. The epidural delivers just one very significant benefit to women in labor - pain relief. Labor and childbirth is painful and the pain and discomfort can last for hours or even days. Aside from the obvious physical discomfort, pain can cause mental stress and anxiety. The epidural is highly effective at eliminating this pain and discomfort. The reason why epidurals are best method for pain management during childbirth is that they only numb the lower body. This allows the mother to stay awake and mentally alert during delivery. The other critical benefit of having an epidural setup is that the mother's lower body is already numb which enables doctors to perform an emergency C-section immediately. If an epidural is not in place already, doctors will have to administer general anesthetic before a C-section. This takes longer and leaves the mother unconscious for the moment of birth. One initial drawback or limitation with an epidural is that it takes some time and effort and there is only a limited window of time when it can be done. Doctors have to wait until the cervix is at least 4 centimeters dilated before doing an epidural, otherwise it will slow everything down too much. However, once the cervix becomes fully dilated it is too late for an epidural to be given. Another con of the epidural is that inserting the needle into the spine can be quite painful. Lowered blood pressure: sometimes an epidural causes the mother's blood pressure to drop too low requiring doctors to intervene and take measures to increase blood pressure. Headache: many women report experiencing severe headaches from epidurals, especially when the needle is first inserted. Urinary infrequency: because the epidural numbs the mother's lower body she may not be able to feel when her bladder is full which triggers the sensation to urinate. If this happens a catheter may be necessary. Infection: although rare, sometimes the epidural needle may not be properly sterilized and cause a potentially serious infection in the nerves. Not all mothers will experience these side effects with an epidural. Another major drawback of getting an epidural is that it tends to immobilize the mother. With a low dose epidural the mother may still be able to stand and walk, with help. But a full-strength will completely numb the mother's lower body and leave her unable to control her legs enough to stand and walk. The most significant downside of an epidural is that it may actually make the labor and delivery process take much longer. The epidural is very effective at numbing the nerves and muscles in a mother's lower body. The problem is that this makes the mother less able to use her muscles to effectively and rapidly push the baby out. When the mother is not able to push effectively it prolongs the delivery process and puts the baby under more stress. The longer the delivery process takes more risk there is for a birth injury. To learn more read our page about Epidurals and Birth Injuries.